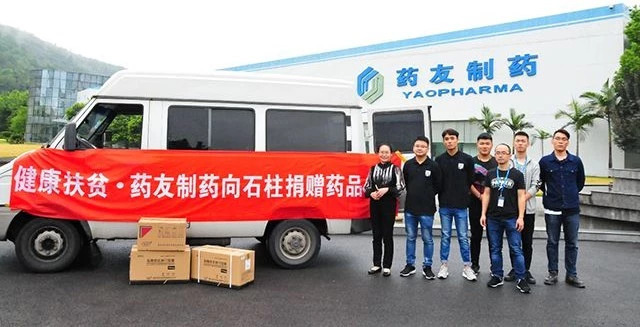 On Sept. 14, 2018, YaoPharma donated more than 300,000 RMB worth of antihypertensive and hypoglycemic drug to Shizhu County, Chongqing — one of the stationed counties of Fosun’s Rural Doctors Plan, to help them improve their work. Since the beginning of this year, YaoPharma has been actively engaging in Rural Doctors Plan, dispatched employees to different rural doctor stations in Shizhu, to communicate and help rural doctors solve their difficulties. Learning that they are lacking of drugs for chronic diseases, YaoPharma quickly allocated more than 300,000 RMB worth of antihypertensive and hypoglycemic drugs to Shizhu County, to help them improve their work. With the mission “Serving human health whole-heartedly”, YaoPharma take its social responsibilities actively. YaoPharma Established several public welfare programs, actively engaged itself to Fosun’s Rural Doctors Plan, propagate health knowledge in schools, communities, hospitals and villages, provide material and spiritual assistance, giving back to the society and people.